DIY Cocktails and I made a new fall cocktail. It’s a twist on the Hot Toddy called the Gingerbread Toddy. First we made gingerbread syrup and then we mixed it in with bourbon, hot water, and a little bit of lemon. The result is cozy drink that’s perfect for sipping in front of a roaring fire. And yes, it tastes just like gingerbread. The syrup took only a few minutes to make and would be great in other things too. I’m going to use a bit tomorrow morning when I’m making coffee and try out my own Gingerbread Latte. To Make The Syrup: Combine all the syrup ingredients in a pan. Heat to boiling on a stovetop while whisking until all the powdery substances dissolve. Boil for 2-3 minutes so that the syrup thickens slightly. 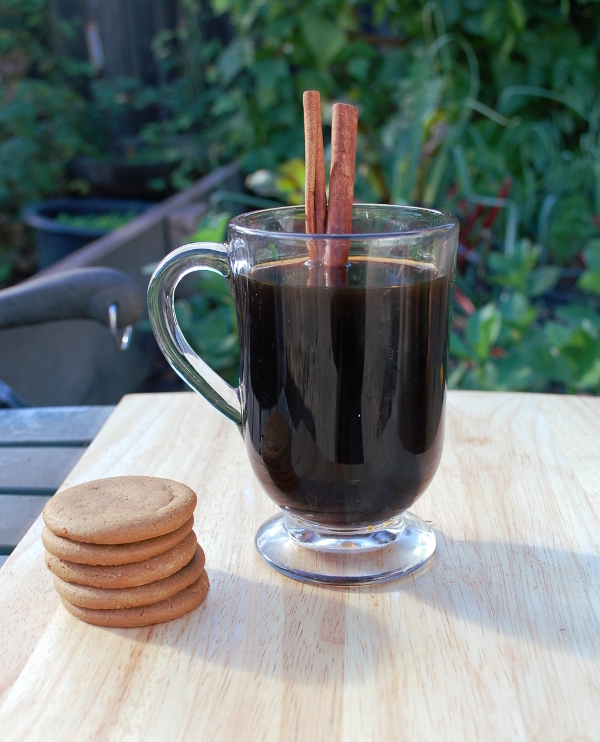 To Make The Gingerbread Toddy: Combine bourbon and syrup in a mug. Fill to the top with hot water. Add a few drops of lemon juice and stir. Enjoy! Hi there! I think this drink looks so tasty, and in fact I like it so much I’ve shared it as the “Friday Happy Hour” feature on my blog’s Facebook page I know my readers will like it too! Christin, Thank you! I hope your readers enjoy. Have a great weekend.